Global trade is one of my favorite variables to track in gauging the state of the global economic cycle. It both reflects changes on the demand side, as well as flow-on effects on the supply side. 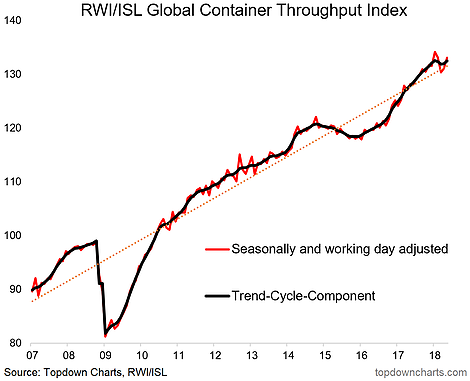 So of course the RWI/ISL Global Container Throughput Index is something I pay due attention to, particularly as it is based on actual activity (number of containers going through ports), and it comes out on a timely basis (May flash results were out last week). After a clear deceleration in March and April, the index has ticked higher in May. This is important because a further decline would signal problems for the global economy. It’s a similar observation/conclusion as the one I reached last week when I talked about the weekly indicators for global trade—where likewise there was a clear slowdown and subsequent rebound more recently.